From weddings, to honeymoons and even anniversaries Maui provides the perfect setting for your special occasion. Everywhere you turn there are pristine beaches, beautiful hotels and amazing restaurants to be enjoyed. 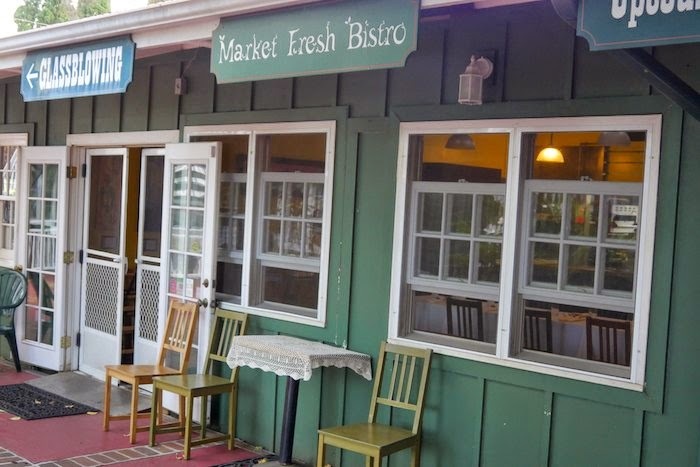 I recently had a chance to dine at Maui’s Market Fresh Bistro, a cozy restaurant that’s been serving mostly local, always fresh, food to a loyal customer base for upwards of 6 years. Chef Justin Pardo, his sister Olivia Coletti and her boyfriend David Magenheim are the masterminds behind this fabulous little upcountry restaurant. 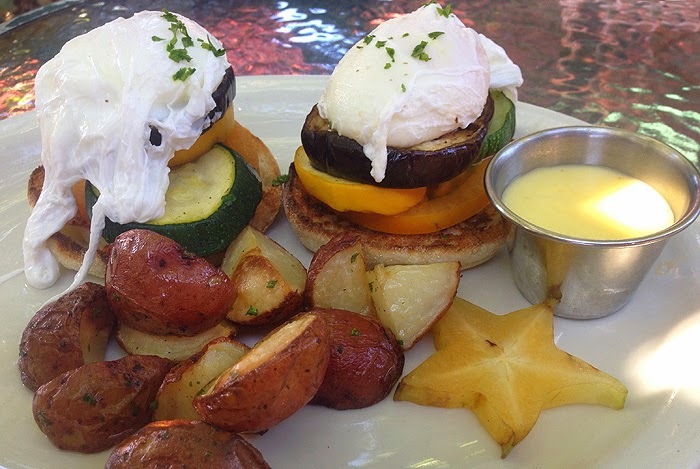 Enjoy breakfast or lunch, any day of the week, either inside or under the trees on the charming outdoor patio. If you want a real treat I suggest making reservations for a Thursday night Farm Dinner which is put on in conjunction with a rotating list of local farms. Every Thursday morning Chef Pardo sources ingredients from a different farm and puts together the evening’s menu based on what was delivered. On Farm Dinner nights the normal restaurant seating is converted into a communal table; making it the perfect setting for small groups. The farmer is usually seated amongst the guests and available to answer questions. 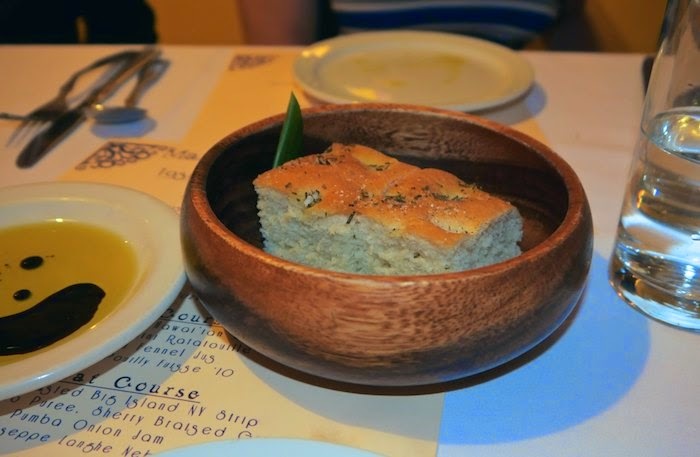 David greets you at the door and shows you to your assigned seat at the table, where you are served some house made focaccia and dipping oil, while waiting for others to arrive. The Thursday I attended Chef Pardo was working with Kupa’a farms, a local farm run by Gerry Ross. Gerry, a former, geologist has been running the farm, along with Janet Simpson, since 2003 and is extremely knowledgeable when it comes to produce and how to cook it. It was a pleasure having him dine with us and to hear him passionately describe the fruits and vegetables used in the evening meal. 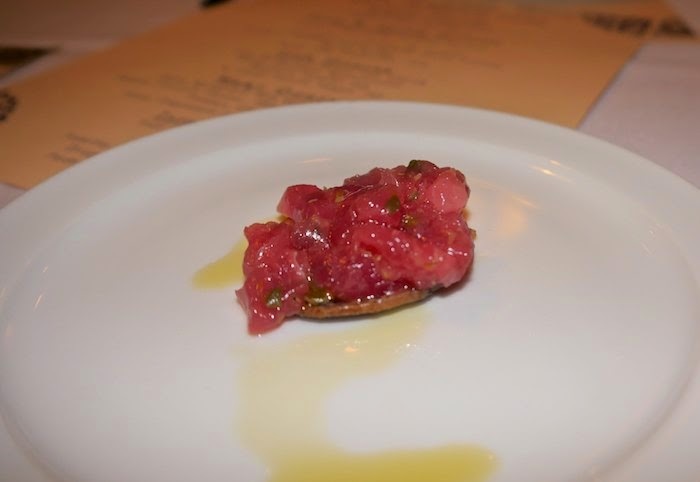 To get our palates started we were served an amuse bouche of Ahi Tartare placed atop a crispy purple potato chip and drizzled with olive oil. This was followed by the Kona Lobster Bisque and a smoked heirloom tomato salad. Chef Pardo explained that he uses almost no cream in his cooking and utilizes the creamy texture of the Yukon gold potato as a thickener in various dishes including the bisque. 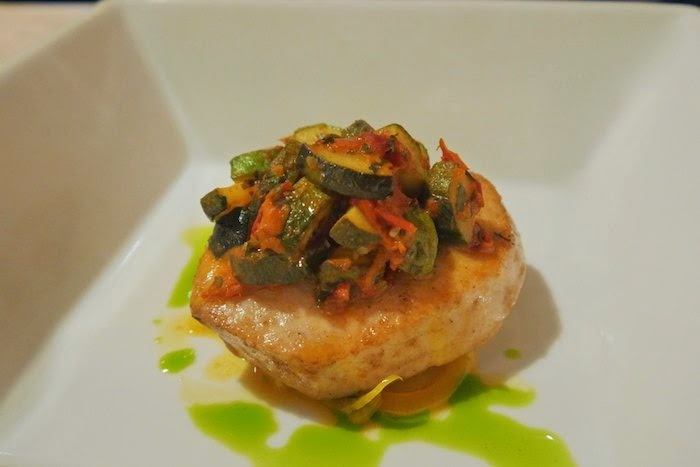 The fish course included a pan roasted Opah with baby zucchini ratatouille. I loved the way the subtle hint of fennel and saffron from the jus complimented the delicate fish perfectly. 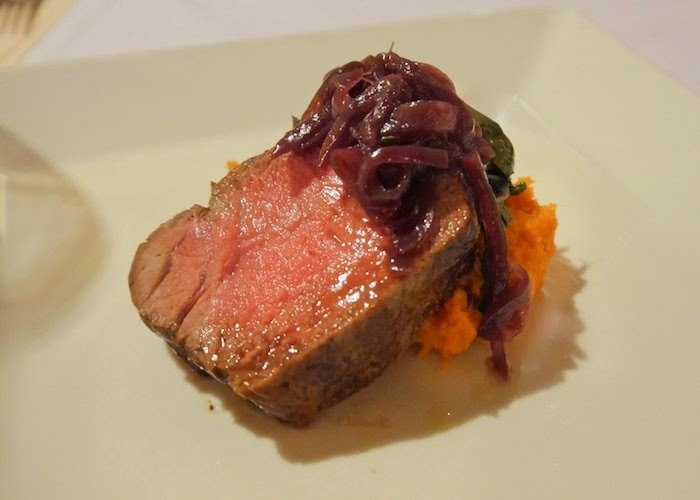 Up next was a slow roasted NY Strip from the Big Island served with a sweet potato puree and a pumba onion jam. Pumba onions are large yellow onions that are very sweet compared to the everyday onion. 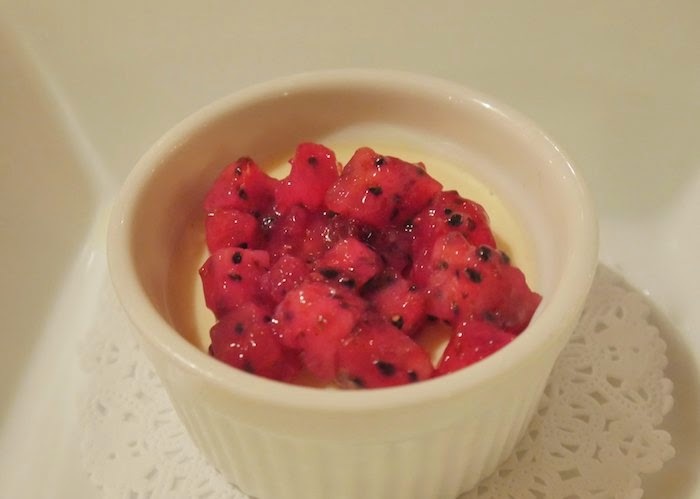 Dessert was a vanilla bean panna cotta topped with amazing dragon fruit compote. This was my first taste of dragon fruit and I'll admit I was completely smitten. No matter what the occasion, if you find yourself on the island of Maui, I would recommend a meal a Market Fresh Bistro, especially if it’s a Thursday night. Atmosphere: Cozy with rustic charm. Serves breakfast & lunch daily. Group dinners available on Thursday & Friday nights. 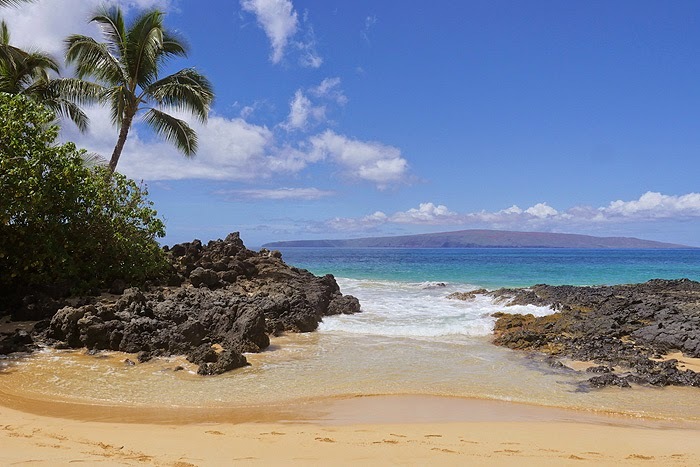 These Hawaii posts are making me crave a getaway! Hawaii...take me away! 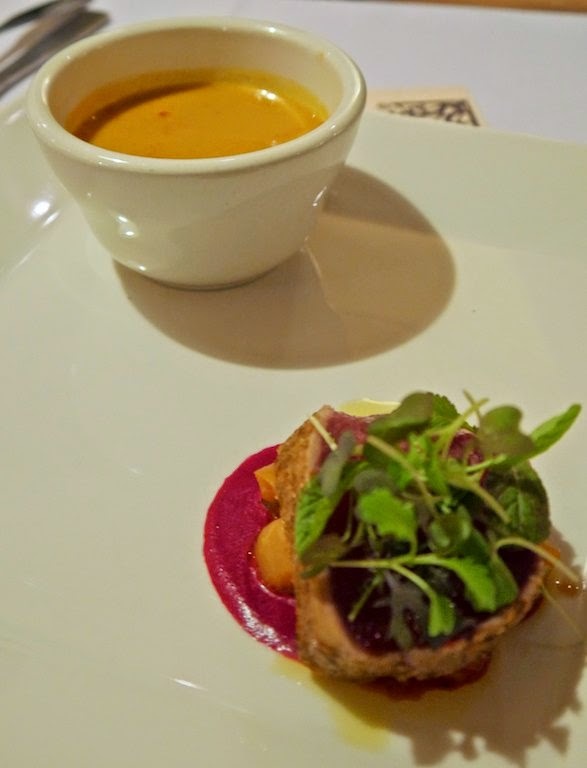 The Opah sounds absolutely mouthwatering! Such a fun place, I'd love to eat there. What a cute little place, and it looks as though the food is fantastic! I could totally use a trip to Hawaii right about now. Super cute restaurant. I miss Maui!!!! You are making me reeeeeally want a vacation right now! What a great meal you had! I've never been to Maui! Very jealous! I want that Benedict. Ok, I want all the food here. Dragon fruit compote? Sign me up! It's been way too long since I've visited Hawaii! I need to get back there SOON. What a great place! I would love to be sitting there right now, eating that lovely meal. This looks like an amazing meal. I'm always a huge fan of farm to table cuisine and this one looks great! I think I could eat all my meals there while on vacation! Looks delicious, especially that fresh Opah! This looks like a fabulous restaurant! I love the idea of a Farm night and a giant communal table. That looks amazing! I love communal tables -- especially if the people at the table are friendly. So fun! I am dying over how delicious all of this looks! Oh dear. I'm so starving after seeing all these incredible photos! That first on in particular really got me drooling! This all sounds amazing. The dragon fruit compote is a great idea! Those dishes are gorgeous. I just love fresh produce. Love the egg dish! This sounds like a great meal! I especially like the look and sound of that bisque you had! Mmm! Mahalo! Now THAT is my type of breakfast. Lovely review.